Immigration made up more than half of Britain's population growth from 1991 to 2001, says a BBC-published report. An Institute for Public Policy Research study of the 2001 Census calculated a 2.2m rise, including 1.14m born abroad. The study found that 7.53% of Britain's 2001 population had been born overseas - up from 5.75% in 1991. Minister Tony McNulty said immigration enabled the country's economic success, but lobby group Migrationwatch said it could not continue at current levels. The data - collated for IPPR by Sheffield Unversity researchers - was published on the BBC News website to show how immigrants play a part in every region and neighbourhood of Britain. Mr McNulty said the immigration situation was a complex one with people leaving as well as entering the UK. He added: "We need the numbers that the country needs for economic success." "The notion that the answer to any difficulties we have is to pull up a drawbridge and say no one else is allowed... is complete nonsense." But Migrationwatch's Sir Andrew Green said: "We believe there is a growing realisation that immigration simply cannot continue at these levels." He said the government was "riding roughshod over the views of the public". And shadow home secretary David Davis said the immigration system was an "utter shambles" and must be controlled. "This is essential so as to not place any undue strain on our public service, housing and transport infrastructure or to harm social cohesion," he said. 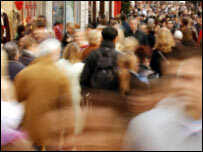 The 2.2m rise in Britain's population, excluding Northern Ireland, in the 10 years to 2001 represented an increase of 4%. The 1.14m overseas-born residents brought the total born abroad to 4.3m - many of whom were now British citizens. IPPR director Nick Pearce said the study showed diversity had "changed considerably" over the past 10 to 15 years. The research confirmed the vast majority of immigrants continued to settle in London or south-east England. Immigrants comprised a quarter of the capital's population and in one area, Wembley, just over half of all residents. Scotland, the South West and north-east England - three of the areas to have seen the least immigration over 50 years - were among those showing greatest recent increases, although the actual numbers remained relatively small. Glasgow Easterhouse was home to the smallest number of people born abroad. In three areas - the North West, North East and London - the data showed a decade of immigration had halted a significant decline in regional populations. The largest groups of people born abroad were people born in the Republic of Ireland, India, Pakistan, the Caribbean and the USA. Germany appeared high in the list - but many of those were children of British forces personnel stationed in that country. The data showed a rapidly changing picture, with arrivals from South America, Europe and parts of Africa now growing. The Born Abroad project also brought together information on how well people fared within the economy. It revealed a complex picture of performance, including significant gaps within national groups as well as between them. It suggested some nationalities, particularly those who had come initially to seek refuge rather than work, tended to do worse - nationalities in this group included people from Iran, Angola and Somalia. However other nationalities such as New Zealanders or Filipinos, who generally first arrived on temporary work permits, had the highest recorded rates of employment. Nationalities that tended to come to the UK to fill low-skills jobs, such as people born in Bangladesh or Hong Kong coming to catering posts, tended to remain poorly paid.